Developed by Dr. Benjamin S. Bloom (1956), Bloom’s taxonomy is classification structure of learning. It one of the concepts that performance improvement professionals should understand because so often we speak of “skill building” or “building competencies” and usually this kind of vague statement or objective is undermined by a lack of precision in the learning objective: specifically what level of knowledge does a role require? How do we know when someone has the requisite knowledge? In each domain, there are levels of learning ordered in degree of difficulty. The Cognitive domain is most frequently referenced of the domains. 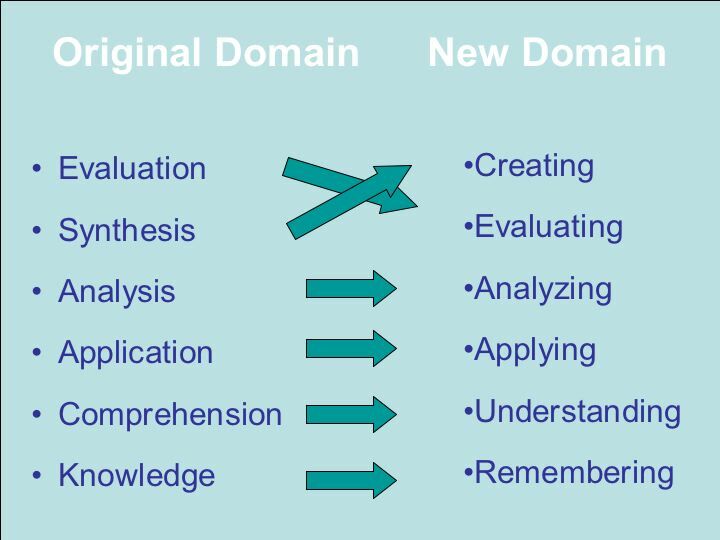 In 2001 there were some adjustments to the structure, creating what is called Bloom’s revised taxonomy. It is the revised taxonomy for the cognitive domain that is outlined below. Examples: Recite a policy. Quote prices from memory to a customer. Knows the safety rules. Comprehending the meaning, translation, interpolation, and interpretation of instructions and problems. State a problem in one’s own words. Examples: Rewrites the principles of test writing. Explain in one’s own words the steps for performing a complex task. Translates an equation into a computer spreadsheet. Use a concept in a new situation or unprompted use of an abstraction. Applies what was learned in the classroom into novel situations in the work place. Examples: Use a manual to calculate an employee’s vacation time. Apply laws of statistics to evaluate the reliability of a written test.